Finding the Greater University Hill area of Syracuse, New York, is not hard considering the neighborhood rises 300 feet above downtown. Making a trip to "The Hill," as residents call it, is becoming easier given a new shuttle bus and other improvements stemming from a recent partnership between the university community and City Hall. Known as the "Connective Corridor," the partnership is the latest initiative to strengthen ties between downtown Syracuse and the Greater University Hill area, which is home to several major medical and educational centers and provides employment for more than 20,000. 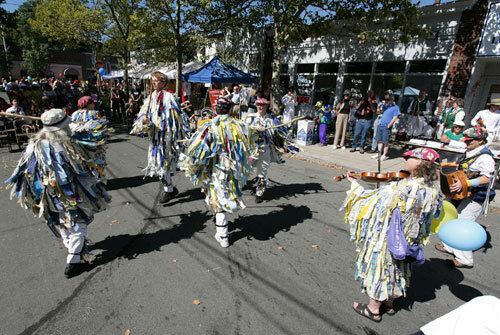 The annual Westcott Street Fair is a popular event that celebrates the diversity of the 'Westcott Nation.' Photo Courtesy of Paul Mercurio. Given the neighborhood's community engagement, as well as its memorable character and role as an economic engine for the central upstate New York region, the American Planning Association (APA) is designating the Greater University Hill area as one of 10 Great Neighborhoods for 2008. Encompassing approximately 2.25 square miles, the neighborhood is characterized by unique topography. A series of drumlins — spoon-shaped hills formed during the last Ice Age — populate the landscape and provide a bevy of natural overlooks. The small green space on top of Westminster drumlin is Syracuse's highest point. Further enhancing the neighborhood's memorable character is its unique housing stock, built primarily from 1900 to 1925 after the neighborhood's creation followed the founding of Syracuse University in 1870. Famous architect Ward Wellington Ward designed a number of the Craftsman-style residences and other buildings on The Hill, while noted Arts and Crafts furniture builder Gustav Stickley lived there and had a gallery nearby. The historic Berkeley Park, one of the city's earliest planned subdivisions, is so well preserved that 126 of the original 137 properties are considered historically significant. 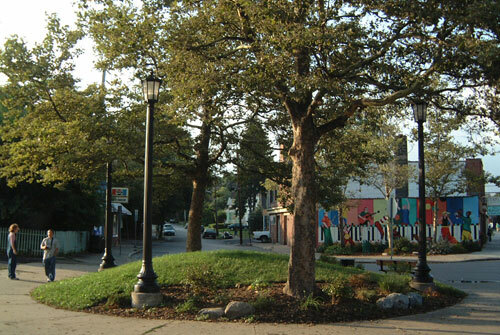 The neighborhood's three largest green spaces — Thornden Park, Barry Park, and Oakwood Cemetery — are used year round. The annual Thornden Park Chili Festival is held in February and can make one's stomach feel as hot as if it were July. The neighborhood's largest employment centers — Syracuse University, State University of New York Upstate Medical University, Crouse Hospital, and State University of New York College of Environmental Science and Forestry — form the economic backbone. Syracuse generates more than $300 million annually in economic impact, and Upstate Medical is nearing completion of the 90,000 square foot Golisano Children's Hospital. The Syracuse Veterans Affairs Medical Center and Hutchings Psychiatric Center also provide additional significant employment opportunities. Three business districts adjacent to the universities offer everything from clothing to pizza. The restaurants and shops along Marshall or simply "M" Street, which has pavers that signify parking stalls, offer the 22,000 college students attending the universities with places to meet and relax after class. The Westcott Street area is nicknamed 'Westcott Nation' because of the diversity of the local residents. This diversity is celebrated in murals and cultural events that take place here. Photo Courtesy of of Paul Mercurio. In comparison, Westcott Street, or "Westcott Nation" as residents refer to it, is more progressive and diverse. Known for its open mindedness and acceptance, residents can purchase everything from Free Trade coffee to vintage clothing here. The only co-op grocery store in Syracuse is just around the corner. The East Genesee Business district, located at the bottom/northern edge of the Hill, has several boutique hotels and a variety of restaurants. It is also home to the Syracuse Stage and Syracuse University's Paul Robeson Performing Arts Company. To add to the creative nature of this corridor, a sculpture garden has been added to the historic Forman Park. Civic participation is the Hill's other hallmark. Thornden Park alone has three groups to help keep it clean. The United Neighborhood Preservation Association promotes long-term neighborhood stability by providing grants of $1,500 to $4,500 for first-time home buyers as well as low-interest loans on exterior renovations for existing homeowners. To expand the neighborhood's strong economy, a focus on alternative transportation intertwined with arts and culture is being developed as a result of the Connective Corridor. Guided by a city-university mutual agreement, building space is being converted for art galleries; shuttle bus service and Wi-Fi access is being provided; and streetscape improvements, with new design elements, are under way. "This [design] process will not only offer new looks for certain city streets, but also is a real sign that our university and city are collaborating in ways to benefit the entire city and the wider region," says Mayor Matthew Driscoll. The Greater University Hill neighborhood is a successful example of what can result when a university neighborhood and surrounding community work together for mutual benefit. The civic activism found here, coupled with the universities' economic strength, will continue to make The Hill a unique and vibrant neighborhood. 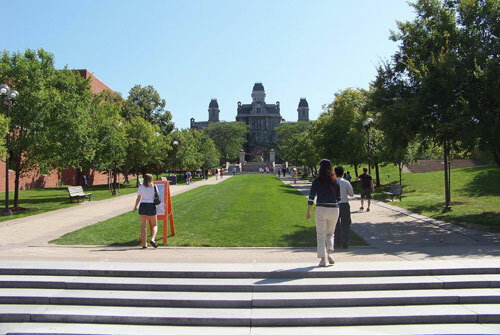 Syracuse University is also famous for it's historically significant buildings. Photo Courtesy of Steve Kearney.